The District’s executive and legislative branches do not see eye to eye on how to bring run-down, city-owned properties back into good use. Amid a rash of bills considered Tuesday, local lawmakers gave final approval to legislation that would permit a D.C.-based nonprofit to take ownership of, and rehab, four such homes in Anacostia. 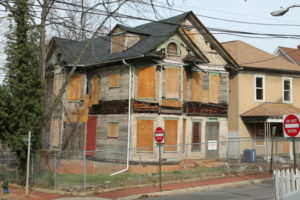 The two-story houses, situated in the neighborhood’s historic district, have remained derelict for years, even as investment in east of the river communities has gradually flowed in. One recent marker of that paradigm shift: Busboys and Poets will soon open a location on a central stretch of Martin Luther King Jr. Avenue SE, where a furniture store used to be. Neighbors have long bemoaned the sorry state of the four homes, especially because they are managed by the District government. The Department of Housing and Community Development holds them in a portfolio administered by the agency’s Property Acquisition and Disposition Division, or PADD, whose mission is to ensure blighted and vacant houses become livable again. PADD oversees more than 160 properties, just under half of which are in Ward 8, and more than a dozen of which are within the Anacostia Historic District.